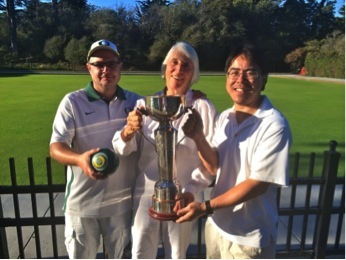 Berkeley members John Hooper (skip), Cathy Dinnean (vice), and Wilfred Wong (lead) took first place to win the SFLBC Centennial Cup, beating a large field of twenty teams from all over the Bay Area. San Francisco provided a beautiful day in Golden Gate Park October 5 for the annual tournament, which is open to all PIMD members, and which celebrates the founding of the oldest lawn bowling club in the USA. The sixty bowlers enjoyed an enticing spread of coffee and bountiful snacks before heading for the greens and playing three 12-end games. The mood was high, and everyone enjoyed the competitions and the friendship. Berkeley was represented by five full members and two dual members. At the end of the day, only two teams had won all three of their games, and when differential points were considered, the Berkeley team edged out a Palo Alto team by the very narrow margin of three points. As a result, they will get their names engraved on impressive trophy (see photo). Bowlers from the other clubs were generous with their congratulations, and SFLBC ended a great day with more gustatory delights. Congratulations to John, Cathy, and Wilfred!